Samuele Bacchiocchi is a Seventh Day Adventist who defends his Adventist point of view in many books. However, on this “neutral” subject I found him very helpful. In fact, he borrows heavily from Robert Teachout. * Teachout also endorsed the book before Bacchiocchi added a chapter commending Ellen White. His historic information on wine is excellent, but his endorsement of SDA and especially of Ellen White will keep this good material on wine from being used popularly. 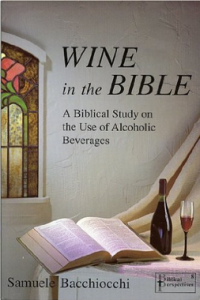 *Dr. Teachout wrote his Th.D dissertation at Dallas Seminary in 1979 on “The Use of ‘Wine’ in the Old Testament.” It is in book form titled, The Biblical Imperative: Total Abstinence. However, it is difficult to find and very expensive.